THERE WILL BE NO EXTENSION OF REGISTRATION TIME. Please bring at least one (1) Government Issued ID or your current company ID. If you registered as a student, please bring this school year´s ID. (with picture and signature). Ride Pack will NOT be released without presenting proper identification card. We also recommend that you bring additional ID cards just in case there is a need for further identification. Authorization letter together with a copy of the participant´s valid ID will be required if ride packs are to be claimed via a representative. 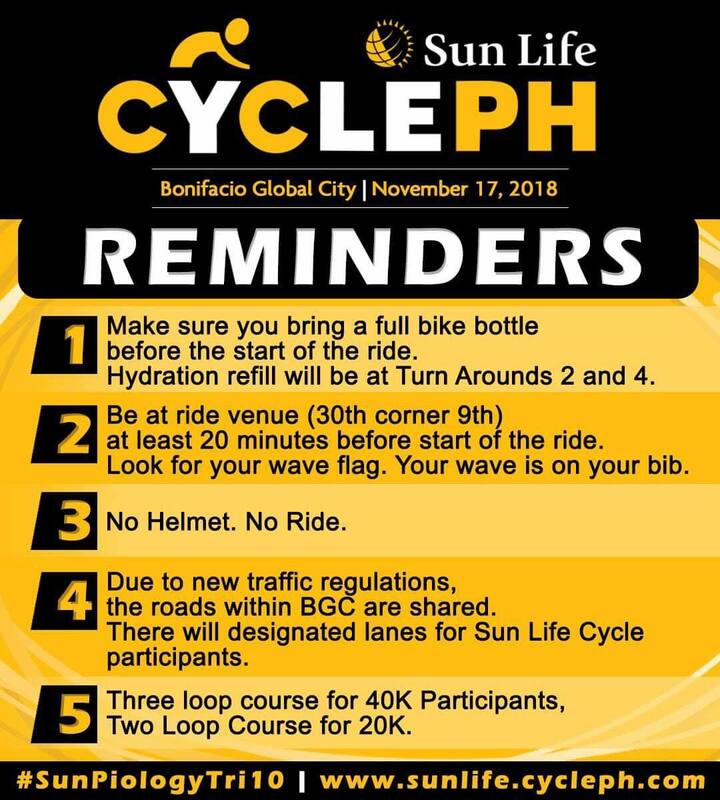 Ride Packs must be used by the registered participant only. Transferring your registration without proper notification to the organizing committee will mean 5 Years BAN from ALL Sunrise Events, Inc. races. Ride packs for kids can be claimed by their parents/guardians. To claim, valid IDs of both the kid and parent/guardian should be presented. The use of aerobars and tri-bikes are discouraged for your safety..
Finisher´s meals will be provided to all participants. The NO HELMET, NO RIDE rule will be strictly implemented on ALL ride categories, kids and adults.